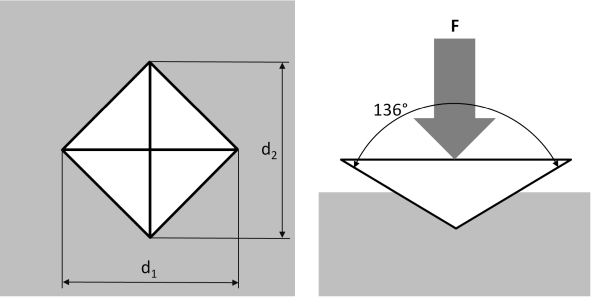 Vertical indentation with a quadratic diamond pyramid. Measurement of the indentation diagonals d1 and d2. The distance from the middle of a test indentation to the edge of the sample has to be at least 2.5 fold the diagnoal length (soft materials 3d). The centers of two indentations have to be at least 3d apart (soft materials 6d). Differences of more than 5 % between the diagonal lengths have to be indicated in the test report. Vickers method has been developed by Smith and Sandland in 1925. The decisive motivation came from flattening the Brinell steel ball, with which tests could be made up to a hardness of 450 HBS.